According to geologic record in the minerals, Earth’s magnetic dipole polarity reversed many times during the planet’s 4.5 billion year history. The average time between reversals is 250 thousand years. There were no reversals in the last 780 thousand years. It seems that we are overdue for a reversal. 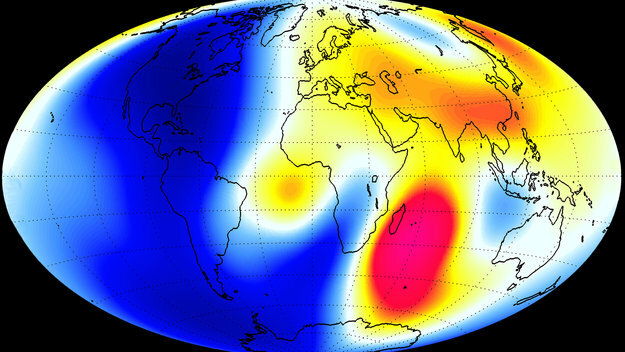 Earth’s magnetic field strength has been weakening in the last 2000 years. The trend accelerated in the past decades. There is news from the European Space Agency (ESA) that Earth’s magnetic field has weakened 10 times faster in the Western hemisphere in the last 6 months. You can read the description of the results directly from the ESA article. The NOAA National Geophysical Data Center maintains a data set of annual magnetic north pole coordinates going back to the year 1590, derived from early measurements from ships logs to modern day techniques. Noting that there has been lots of reporting of pole shift lately, to the point where the phenomenon is actually causing real-world issues such as temporary airport closures, a deeper investigation was in order. Mega-thrust earthquakes like the ones that recently struck Chile and the Fukushima region of Northern Japan, can cause the magnetic field to flip. If a quake is strong enough there is evidence it may even set off a geological pole shift tossing the Earth off its current axis and killing billions of people within a matter of minutes. This the grim picture painted by decades of research and evidence strewn from the peaks of the Andes to the volcanic shards lying off the Pacific islands of Hawaii. Surveys show the magnetic north pole is moving faster, threatening everything from the safety of modern transportation systems to the traditional navigation routes of migrating animals. Scientists say that magnetic north, which for two centuries has been in the icy wilderness of Canada, is currently relocating towards Russia at a rate of about 40 miles a year, reported The Independent.